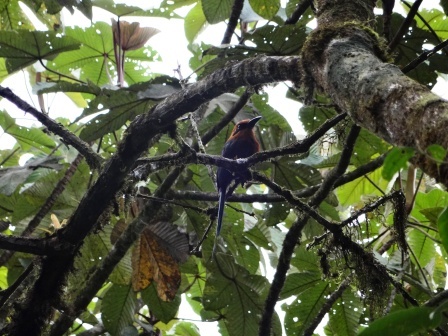 Mindo Ecuador is one of Ecuador's most popular bird-watching havens. 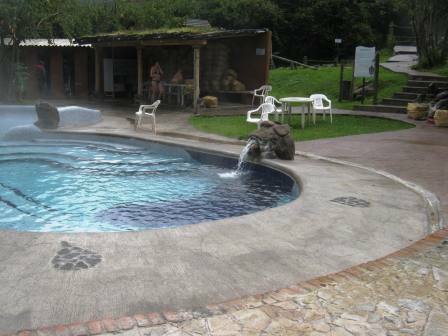 Set in a deep valley just behind the Pichincha volcanoes, Mindo offers a wide array of bird, insect and plant life. Mindo Ecuador is in a cloud forest and you will see why; the clouds settle in the valley. At an elevations of 4,100 feet (1250 meters) Mindo is really in a deep valley. Quite a change from Quito's 9,350 feet (2800 meters). 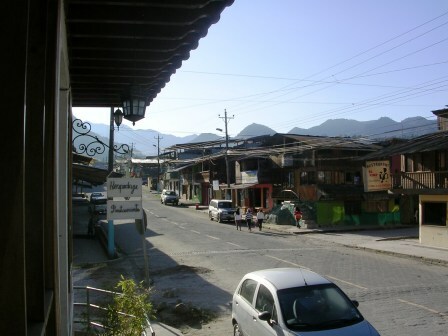 Found just 2 1/2 hours northwest of Quito, the town of Mindo is tiny. Literally it has one main street, a park and a couple intersecting streets. Nothing more. Even so we got lost. 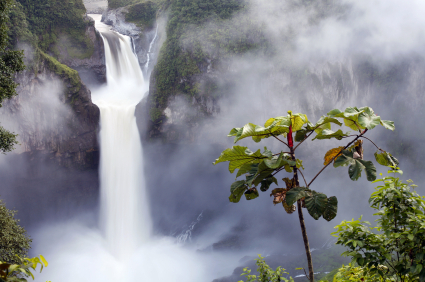 The first day we were in Mindo Ecuador we wanted to see the waterfalls that we had heard about. There are two roads out into the Mindo-Nambillo nature reserve. If you aren't bombarded with signs advertising the waterfalls and canopying, you're on the wrong road. 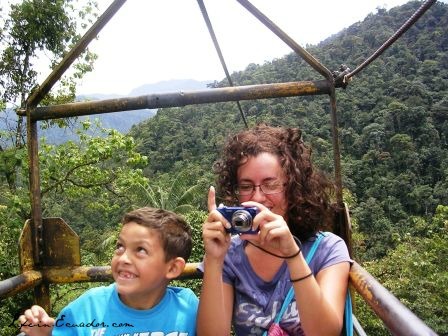 Once we figured out where we were going, we headed up the road that took us high up a mountain to a cable car (tarabita). The cable car crosses a 1,640 feet (500 meter) wide valley about 500 feet (150 meters) up in the air. The car seemed very stable and safe. Just don't look down if you don't like heights. From the other side there were well traveled paths to seven different waterfalls. You could spend all day hiking the paths. Since we had wasted most of our day getting lost, we only went to two of the waterfalls. 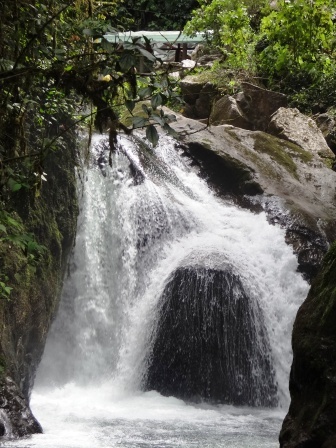 The Cascada Nambillo was very pretty and the river was perfect for soaking your feet. 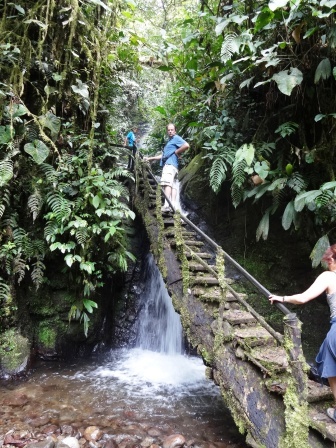 We also walked to the Cascada Reina, which we the tallest of the waterfalls and so we hoped it would be the most impressive. The hike was much longer than we expected and I think that damped our view of the waterfall. There were some cool steps up to the waterfall. As we walked through the reserve we noticed lots of different butterflies. One I especially liked had transparent wings that made them look super delicate. The plant-life in the reserve was also pretty neat. It reminded me of Jurassic Park. After a while, we realized we hadn't really seen any birds. It wasn't that they weren't around, we just hadn't opened our eyes and looked. Once we did we saw some super cool birds. Some 325 species live in the area. The one in the photo below was so pretty, with bright blue and red feathers. 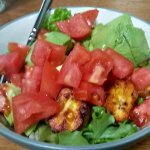 Sorry the photo is a bit "Where's Waldo" -like; my bird photography skills could use some work. Just sitting at our hotel we saw tons of hummingbirds. Check out the hotel we stayed in. Mindo Ecuador reminded me of a mini-Baños. It had many similar activities since both places are so nature oriented. 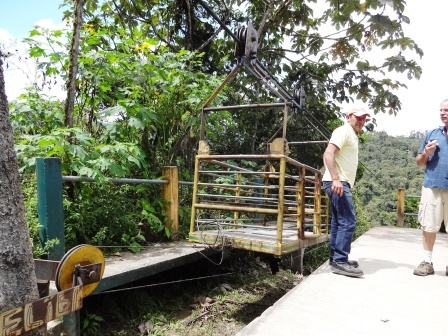 The road to the cable car and waterfalls has two different zip-line operators for the adrenaline junkies. You can go down the river in tubes. You can rent bikes, four-wheelers or horses. The one thing we didn't get to was the Orchid Garden. I really wanted to see that. Next time. Mindo also has several butterfly farms and an organic coffee farm. Walking through town we just happened upon a nameless restaurant with the best pizza we've eaten in all of Ecuador (says a lot since we eat pizza everywhere we go). It was so good we went twice in two days. To find it, walk toward the park on the main street. On the very next corner after you pass the church (same side of the road as the church) you will see a restaurant with a huge pizza oven behind the counter. Don't miss the pizza! We also had lunch at Caskaffesu. The people were friendly, the food was good and the atmosphere was great. We had looked at rooms in their hotel as well. They were very nice, just more than we wanted to pay.